Wollongong Illawarra Roller Derby formed in January 2009 and started skating in local carparks that February. They played their first bout in November 2009. The league now has over 50 skating members and earlier this year they split into their first home teams, the Vipers and Vixens. These teams are two games into their first five bout home season with the Vixens currently in the lead. 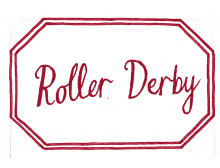 WIRD have been a driving force behind the establishment of the Eastern Region Roller Derby competition for local leagues and are currently participating in the second year of this tournament. The league also represented the Illawarra at the first modern Australian roller derby nations, The Great Southern Slam, hosted by the Adelaide Roller Derby League in 2010. The league would not be where it is without the support and encouragement of other local leagues, including Sydney Roller Derby League, Newcastle Roller Derby League and Canberra Roller Derby League.